ECR Minerals plc is pleased to provide its unaudited interim results for the six months to 31 March 2011 along with the following update on its activities. The Company as consolidated with its subsidiaries (the “Group”) has recorded a surplus for the period of £7,436,715, net of tax. This surplus compares with a deficit of £2,291,840 for the six months ended 31 March 2010 and is composed of £3,834,241 of realised profit, £3,616,043 of revaluation gains and £13,569 of exchange translation adjustment. The surplus has arisen almost entirely from the successful sale of ECR’s option over the Copper Flat project in New Mexico, USA to THEMAC Resources Group Ltd (“THEMAC”), which not only delivered to the Company 10.5 million shares and 10.5 million warrants of THEMAC by way of consideration, but also triggered the conversion of 4 million subscription receipts of THEMAC held by the Company to a further 4 million shares and 4 million warrants. The subscription receipts were acquired by ECR in May 2010 for consideration of C$0.15 per subscription receipt, or a total of C$600,000. The closing price of THEMAC shares on the TSX Venture Exchange on 28 June 2011 was C$1.00. The aggregate effect of the Copper Flat transaction, which completed on 4 March 2011, has enabled ECR to record an increase in its net assets of 442% to £14,395,701 as at 31 March 2011 (as compared with £3,257,306 as at 31 March 2010). As at the date of completion, the effective consideration received by ECR for the sale of its option over the Copper Flat project totalled some £10,359,061, a figure which includes US$5,271,076 of costs paid by THEMAC on ECR’s behalf between the date in March 2010 on which initial terms of the transaction were agreed and the date of completion. This translates to an accounting profit for the transaction itself of £6,025,645. The Company has also recorded a revaluation gain of £4,853,935 pre-tax in respect of the increase in the value of its holding of THEMAC shares and warrants between 4 March and 31 March 2011 and in respect of the gain arising at 4 March 2011 on the difference between the value of the shares and warrants issued on conversion of the Company’s THEMAC subscription receipts and the cost of the subscription receipts. As at 31 March 2011, ECR’s holding of THEMAC shares and warrants was valued at a total of £12,376,066, a figure which would be substantially higher on the basis of THEMAC’s share price at the time of writing. Of the Company’s holding, some 4 million shares and 4 million shorter dated warrants are freely tradeable, with the remainder of the securities subject to a 4-month hold period imposed by the TSX Venture Exchange. This period will expire on 5 July 2011, from which date all THEMAC securities held by the Company will be freely tradeable. ECR currently holds 14.35 million shares and 14.35 million warrants of THEMAC. ECR’s shareholding is equivalent to approximately 19.3% of THEMAC's issued shares, and combined with the Company’s warrants gives a 21.3% fully diluted interest. THEMAC presently has a market capitalization of approximately C$74 million. All the warrants held by ECR are exercisable at C$0.28 per share; 3.85 million warrants are valid until 3 May 2013 and the remaining 10.5 million warrants are valid until 4 March 2016. THEMAC through its wholly owned subsidiary New Mexico Copper Corporation (“NMCC”) now holds a 100% ownership interest in the Copper Flat project. Since completing its acquisition of ECR’s option, THEMAC has made the final US$7 million payment required to exercise the option and has also made a US$1 million payment towards the acquisition of water rights necessary for the proposed future operation of Copper Flat as a mine. THEMAC completed a preliminary economic assessment (“PEA”) for the Copper Flat project in June 2010, and in June 2011 announced that it intends to award a contract to an independent engineering firm for the completion of a prefeasibility study on the project. Completion of the prefeasibility study is expected towards the end of 2011, and it is expected that Copper Flat will enter production in late 2014 or 2015. On June 21 2011 THEMAC commenced an 18,000m core and reverse circulation (RC) drilling programme at Copper Flat. This programme will consist of infill and step-out holes and aims to achieve an upgrade of the current Copper Flat NI43-101 resource to higher categories along with a more precise definition of the ore body, and will also provide geotechnical data and samples for metallurgical test work. A number of drill holes will be targeted to test anomalies outlined by a major geophysical programme carried out at Copper Flat earlier in the year, offering the prospect of the discovery of additional mineralisation and increased total mineral resources at Copper Flat in the future. THEMAC has succeeded in assembling a highly credible management team for the development of the Copper Flat project. THEMAC’s Chairman and largest shareholder is Kevin Maloney, founder of The MAC Services Group Ltd, a leading Australian provider of remote area mining accommodation and services which was recently acquired by Oil States International Inc. for in excess of US$600 million cash; Barrett Sleeman, CEO and Director is an experienced mining engineer; and John Cook, Director has extensive mining sector financial experience. THEMAC has appointed two independent directors: Joel Schneyer, currently a Managing Director at Headwaters MB, a US investment bank focused on the mining industry; and Ken Pickering, who formerly held the role of Vice President of Major Projects, Closed Mines and North American Assets for BHP Billiton Base Metals. At the project level, THEMAC has appointed W. Ferol Baker, who was most recently employed as Mine Manager at the Franke Mine in Chile operated by QuadraFNX Mining Ltd, as General Manager of NMCC; Ann Carpenter, who has over 30 years of international mineral development experience, including as President and COO of US Gold Corporation, as Project Director; and Mike Anglin, who has held numerous senior roles with BHP Billiton, as Executive Adviser to THEMAC and NMCC. In May 2011 ECR announced the results of an initial geochemical sampling programme completed at its 100%-owned El Abra gold prospect in La Rioja Province, Argentina during the first quarter of the calendar year. A total of 900m of outcropping gold-bearing quartz veins have been identified at the El Abra prospect to date, and sampling of the veins and the mineralised selvage (vein margins) returned numerous high grades including 80.78 g/t Au, 44.98 g/t Au and 39.74 g/t Au. High gold grades (greater than 5 g/t Au) are distributed broadly across the known veins, and the combination of veins and margins has historically been worked to widths of several metres in some areas of the prospect. ECR acquired 100% ownership of El Abra, which forms part of the Company’s Sierra de las Minas project area, in January 2011 for consideration of US$60,000 plus a 2% net smelter return royalty. The purchase of El Abra built on the acquisition of the Sierra de las Minas and Los Aquirres gold projects, which was announced in October 2010. The Sierra de las Minas project area covers approximately 75,000 hectares of La Rioja Province, with numerous historic small scale gold mining areas and other known gold and base metal occurrences. Access to the main prospects within the Sierra de las Minas project area, including El Abra, is considered good. The Los Aquirres project area is largely unexplored and extends over approximately 5,000 hectares some 50km due north and along strike from Sierra de las Minas. La Rioja Province is located in the northern central part of Argentina approximately 800km northwest of Buenos Aires. The Company proposes a programme of ground based geophysics followed, if warranted, by drilling in order to evaluate the continuity to depth of the high grade mineralisation identified on surface. It is anticipated that the geophysical programme will be initiated before the end of August. Further mapping and geochemical sampling at El Abra and within the wider Sierra de las Minas project area is also planned. ECR’s primary exploration objective for the Sierra de las Minas project area is to identify one or more high grade, small tonnage gold deposits that may be suitable for development to production within a relatively short timescale, and El Abra is judged to be a promising prospect of this type. The Company is additionally evaluating the prospectivity of the Sierra de las Minas project area for copper porphyry mineralisation. A sale of the interest held by Paniai Gold Ltd (“Paniai”) in the Derewo River gold project in Papua, Indonesia to West Wits Mining Ltd (“West Wits”) was agreed in February 2011, and since that time steady progress has been made towards the completion of this transaction. ECR holds 16% of Paniai’s issued shares, and may seek to increase its shareholding in future via the conversion of an outstanding loan to Paniai into shares. Paniai was formed to advance the Derewo River project in joint venture with a local partner. The project comprises a granted 40 hectare mining licence, an application for a further mining licence of 491 hectares, and exploration licence applications extending over around 129,000 hectares. The Derewo River has been the site of significant small scale gold mining and the objectives of the joint venture are to establish a modern alluvial mining operation and to explore a wider area for new gold and copper-gold deposits. As a result of the transaction with West Wits, which is listed on the ASX with the ticker WWI, Paniai and its shareholders are expected to become West Wits’ largest shareholder bloc. Consequently ECR will retain a significant interest in the Derewo River project, which it identified in 2008 before orchestrating a transaction to place the project with Paniai. As part of this process ECR sourced highly experienced management for Paniai and facilitated the raising of more than A$700,000 of seed financing from investors in Australia. ACS Asia, the Thai steel products business in which ECR holds a 70% interest, recorded a gross profit of £437,340 for the period under review compared with £874,058 for the six months ended 31 March 2010, which reflects testing trading conditions encountered by the business during 2010 and the early part of 2011. Turnover for the six months ended 31 March 2011 was £2,019,477 versus £3,163,130 for the same period ending in 2010. However trading conditions for ACS are improving and a better second half to the financial year is expected, in part thanks to a number of significant export orders secured in recent months. Warm Springs Renewable Energy Corporation (“WSREC”), in which ECR currently has a 90% interest, is operating at a reduced level of activity while the impact of recent changes in the state government of New Mexico and developments in the US renewable power sector are evaluated. WSREC’s objective is the development of a new solar power plant in the vicinity of the Copper Flat project in New Mexico. Its activities are managed by Remote Energy Solutions LLC, a renewable energy consultancy with numerous clients in the US mineral sector. Work towards permitting of a number of sites in the vicinity of Copper Flat for solar development has laid the groundwork to exploit future opportunities, which may begin to crystallise as the time at which the Copper Flat project is expected to enter production and become a significant new consumer of electricity in the area draws nearer. In the meantime WSREC remains on the alert with respect to opportunities to supply local utilities. Completion of the acquisition of the Meekatharra gold project in Western Australia held by ECR’s 100% subsidiary Mercator Gold Australia Pty Ltd (“MGA”), in administration since 2008, by Reed Resources Ltd (ASX: RDR) (“Reed”) is expected to occur on 30 June 2011. Shortly after completion ECR expects to resume management control of MGA, based on the approval recently secured from MGA’s creditors for a revised Deed of Company Arrangement (“DOCA”). MGA will be left with A$650,000 worth of Reed Resources shares under the terms of the revised DOCA. The benefit of these shares, which form part of the consideration being paid by Reed Resources for the Meekatharra gold project, will accrue to ECR as MGA’s sole shareholder. The remainder of the consideration will be applied by the administrators of MGA to repay MGA’s single secured creditor, to pay any outstanding employee entitlements, towards the administrators’ own costs, and to partially repay unsecured creditors of MGA with the exception of ECR. 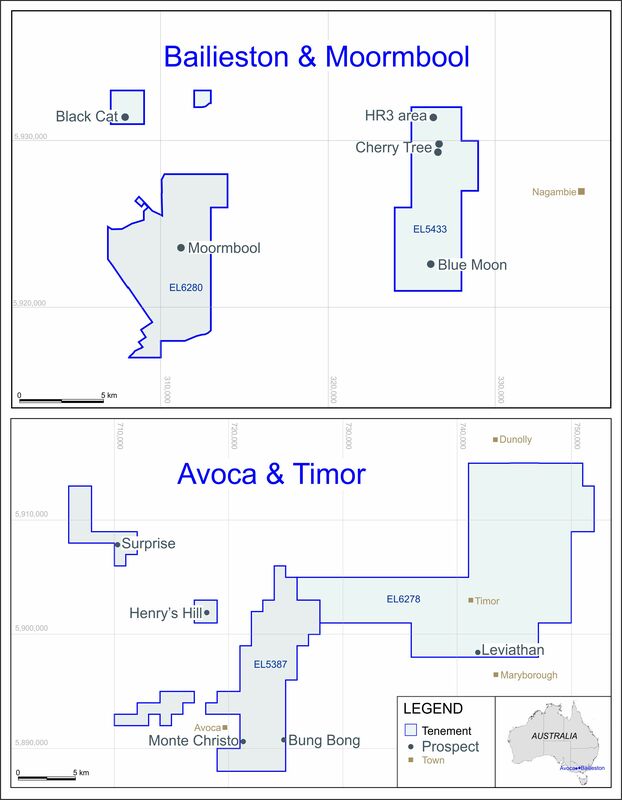 In order to secure creditors’ approval for the revised DOCA providing for the sale of the Meekatharra project to Reed Resources, ECR elected to waive any further share in the proceeds of the sale in exchange for certainty as to the receipt, subject to the completion of the sale, of A$650,000 worth of Reed Resources shares. This was judged to be the most prudent course of action in the circumstances, and the impending completion of the sale will bring to a close the chapter in the Company’s history represented by the Meekatharra project. MGA will however retain in the region of A$100 million of tax losses, which are expected to be of substantial value in future. I am delighted to be reporting to shareholders a substantial surplus for the period, and I expect that the magnitude of gain generated by the Copper Flat transaction will be the first of many such gains for the Company. ECR’s business model of locating undervalued assets and structuring transactions to place them in preferred corporate vehicles for capital raising has now been strongly validated, and we continue to cast our net widely in order to locate other attractive assets, as well as working diligently to advance our existing portfolio. The consolidated financial statements incorporate the financial statements of the Company and its subsidiaries (the “Group”) made up to 31 March 2011. The results of the subsidiaries are consolidated from the date of acquisition, being the date on which the Company obtains control, and continue to be consolidated until the date such control ceases. The interim financial information has been prepared to meet the recognition and measurement requirements of International Financial Reporting Standards (“IFRS”) as adopted by the European Union and implemented in the UK. The financial information in this statement does not constitute full statutory accounts within the meaning of Section 434 of the Companies Act 2006. The financial information for the six months ended 31 March 2011 and 31 March 2010 is unaudited. The comparative figures for the period ended 30 September 2010 were derived from the Group’s audited financial statements for that period as filed with the Registrar of Companies. They do not constitute the financial statements for that period. Inventories are stated at the lower of cost or net realisable value. Costs of raw materials are determined by the weighted average method. The cost of purchase comprises both the purchase price and costs directly attributable to the acquisition of the inventory, such as import duties and transportation charges, less all attributable discounts, allowances or rebates. The cost of finished goods and work in process comprises raw materials, direct labour, other direct costs and related production overheads, the latter being allocated on the basis of normal operating activities. Net realisable value is the estimate of the selling price in the ordinary course of business, less the costs of completion and selling expenses. Provision is made, where necessary, for obsolete, slow-moving and defective inventories. Cash includes petty cash and cash held in current bank accounts. Cash equivalents include short-term investments that are readily convertible to known amounts of cash and which are subject to insignificant risk of changes in value. Profit per share is calculated by reference to the profit for the six months ended 31 March 2011 of £4,034,201 (six months ended 31 March 2010 loss of £1,648,504; and year ended 30 September 2010 loss of £3,385,248) and the weighted number of shares in issue during the periods of 484,896,720 (six months to 31 March 2010, 140,097,397; and year to 30 September 2010, 223,037,596). There is no dilutive effect of share options on the profit for the current period. On 17 October 2007 the Company issued £2,565,000 in face value of three-year convertible loan notes carrying interest at 8.5% per annum, payable quarterly in arrears. As of the first anniversary of issue, the loan notes are convertible at the election of note holders into shares at a specified price. Note holders have the option of accepting the payment of interest in cash or in ordinary shares at the lower of a specified price and the average mid-market closing price per ordinary share for the seven business days prior to the date that interest is payable. The Company has the right (as of the date falling 18 months after the date of issue of the loan notes) to repay the notes early, subject to the payment of double the accrued interest outstanding as at the date of early repayment. The holder of the notes has the option of accepting early repayment in cash or in ordinary shares at a specified price. On 29 September 2010 the loan notes were extended for a further three years and the rate of interest was increased to 10% per annum by extraordinary resolution of the holders. The loan notes are now repayable on 17 October 2013. Until the second anniversary of issue the specified price in respect of the above was 95 pence per share; between the second anniversary and 29 September 2010 the specified price was 120 pence per share; as of 29 September 2010 the specified price was 1.1 pence per share. On 15 July 2008 the Company issued £200,000 in face value of three-year convertible notes carrying interest of 8.5% per annum, payable quarterly in arrears. As of the first anniversary of issue, the loan notes are convertible at the election of noteholders into shares at a specified price. Until the second anniversary of issue the specified price in respect of the above was 50 pence per share; from the second anniversary the specified price was 95 pence per share. During the period the Company disposed of its interest in the Copper flat project in exchange for shares and warrants of THEMAC Resources Group (valued at £7,127,056 at date of disposal) and the cancellation of a promissory note owing to THEMAC (valued at £ 3,232,004 at the date of disposal). Click Here to download the PDF version of ECR Minerals Unaudited Interim Results for the Six Months Ended 31 March 2011 and Update.